Third-year Sarah Muisenga spikes the ball towards her opponent. 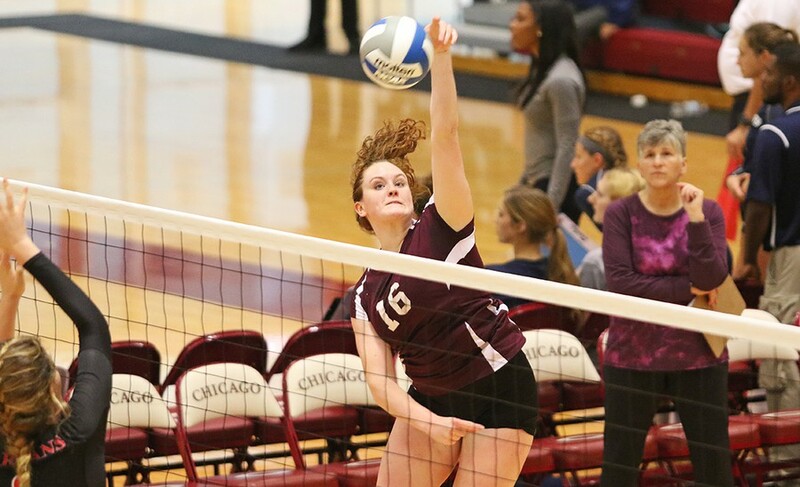 The UChicago women’s volleyball team had a full weekend with the University Athletic Association Second Round Robin. They played a whopping four matches in just two days. The Maroon women started the Second Round Robin with a dominating win against NYU. It was a cohesive and straightforward sweep as NYU remained winless throughout the conference. However, the Maroons faced a difficult challenge against No. 10 Carnegie Mellon. The match was extremely close for the first two sets, with Carnegie Mellon winning the first by only three points, and UChicago using a huge comeback in the second set to win it 27–25. However, after the second set, the team seemed to lose some steam, as Carnegie Mellon took the final set to complete a tightly contested four-set win: a disappointing ending to the match after UChicago had seemingly gained momentum after the comeback in the second. Overall, for the first day of the Round Robin, the team completed a respectable split with a tight loss and a commanding win. On Sunday, the Maroons faced the second day of the Round Robin with matches against Case Western and Wash U. Again, the team came out strong in the first match of the day, winning the first two sets 25–20 and 25–22. However, in the third set, Case Western came out playing to extend their lives in the match and completed a dominant set of 25–17. The Maroon women took the punch to their chins from the third set and came out strong in the end, clinching the match with a hard-fought 25–21. After that exciting opening match, the Maroons faced another difficult test against their rivals, No. 20 Wash U. The team came out strong at the beginning with a close win in the competitive first set, though it seemed that the team ran out of gas after a grueling weekend, with Wash U taking control of the game and winning three straight sets to close it out. Wash U used their size advantage to out-block UChicago, 13–4, thus making it challenging for the Maroons to gain momentum during the match. It was a difficult ending to a day that started out very brightly. In total, the Round Robin finished in a closely fought 2–2 split. The Round Robin split brings UChicago’s record to 19–5 with a 4–2 record in conference play. To sum up the weekend, first-year middle hitter Hadley Grundman said, “This weekend definitely tested us as a team. We started off strong, but as the weekend went on we had to dig deep and come together as a team. Unfortunately, we fell to Carnegie and Wash U, but we will use these losses as motivation for our next matches.” The team seemed to acknowledge the disappointment, but is now hoping to grow from it going into the final parts of the season.